As most people are aware, the Canadian Mint stopped making pennies on February 4th of this year. It is the first step in the phase out of this little copper coin. Many businesses have already stopped giving out pennies in change with their cash transactions, and it is only a matter of time until the penny will be gone forever. With this in mind, the Black Gold Health Foundation is asking you to put the pennies you might have tucked away in a jar, bag, or piggy bank to good use by donating them to their penny drive. You can find donation boxes placed in over 20 locations including the front desk of the hospital, at the Public Health Centres in Thorsby, Beaumont, and Leduc, as well as the Leduc ATB Branch. The Executive Director of the Black Gold Health Foundation, Lorraine Popik, shared that the Leduc ATB has been a fabulous supporter of this campaign in that they have committed to matching every penny donated up to $1,000.00. "This means that every penny turns into two by donating them here!" 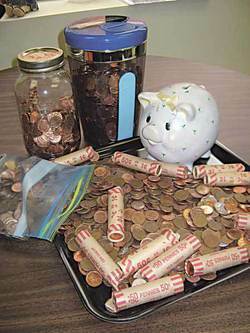 The penny drive began in the beginning of February and was the brainchild of a hospital staffer. "Staff and foundation supporters have been wonderful so far." said Lorraine. "We have had people bringing in mason jars, peanut butter jars, and porcelain piggy banks full of pennies. And one of the nicest things is that the coins don't have to be rolled. We'll happily take them however you can get them to us. We'll even accept larger coins and bills too if people feel so inclined!" Lorraine said with a smile. The monies raised with the penny drive will go into the "greatest need" fund, which means whichever fund has the greatest need at the close of the penny drive will receive the funds. Previous fundraisers such as this helped to equip the Leduc hospital and the regional health centres with AED's (Automated External Defibrillators). The penny drive will run through to the end of March. Another fundraiser that is being run alongside of the penny drive is the Black Gold Health Foundation's quilt raffle. For only $2.00 you can buy a ticket to win one of three handmade prizes donated from Leduc's quilting club. The top prize is a stunning, hand sewn queen sized quilt valued at $3,000.00. Tickets will be available in the front lobby of the hospital and also at various locations throughout town.